The year 2016 marked the first year of implementation of the outcomes of the Johannesburg Summit of the Forum on China-Africa Cooperation (FOCAC) held in December 2015. It also heralded a year of significant progress by the Chinese Government in pushing forward the Belt and Road Initiative. The Sino-African relationship has flourished with close high-level exchanges, deeper political mutual trust, and fruitful economic cooperation on industrial capacity and connectivity. In 2017, China-Africa relations will face both opportunities and challenges. Both governments and enterprises voice strong willingness to strengthen industrial capacity cooperation and connectivity. The Sino-African industrial capacity cooperation, which conforms to the bilateral needs of development, has a solid foundation. China's economic development has seen remarkable achievements since the country adopted reform and opening-up policies over three decades ago. China, which is still in the middle and later stages of industrialization, faces challenges in further addressing excess capacity, while many African countries, with their lower industrialization levels, need to increase their industrial capacity for further development. Africa has abundant human and natural resources, while China possesses more capital resources and advanced equipment, technology and management expertise. These provide sound conditions for China-Africa industrial alignment and capacity cooperation. At the opening ceremony of the FOCAC Johannesburg Summit, Chinese President Xi Jinping said China would roll out 10 major plans to boost cooperation with Africa during the next three years. To ensure smooth implementation, China will provide $60 billion in funding. The key is to boost interconnectivity within the continent and between China and Africa by aligning China's industrial upgrading with Africa's industrialization and the China-proposed Belt and Road Initiative with the development strategies of Africa. Of that $60 billion, $10 billion is for a fund to support China-Africa production capacity cooperation. China will mainly work with Africa on the construction of three major infrastructure networks, namely railway, aviation and highways. Implementation of the various agreements and projects, as well as China's direct investment and commercial loans are making good progress, as indicated in the Sherpa Meeting on Implementing Outcomes of the FOCAC Johannesburg Summit, held in Beijing in July 2016. The AU's Agenda 2063 and its first 10-year plan vow to accelerate Africa's industrialization, strengthen infrastructure construction and achieve sustainable development. As early as January 27, 2015, China and the AU signed a memorandum of understanding (MoU) to cooperate on major infrastructure networks and industrialization process in Africa. According to the MoU, China will, within the framework of Agenda 2063, enhance cooperation with African countries in infrastructure construction and industrialization with an aim to accelerate the integration of Africa. In addition, China signed capacity cooperation framework agreements with some African countries such as Tanzania and Ethiopia. Progress has been achieved in a number of key cooperation projects, including renovation and reconstruction of the Tanzania-Zambia Railway and construction of a transmission line from Dar es Salaam to Arusha in Tanzania. With a total investment of $220 million, Ethiopia's Eastern Industry Zone encompasses 64 Chinese enterprises, among which 31 went into operation, generating more than 8,000 employment opportunities for local people. On October 24, 2016, findings from Afrobarometer's survey of 54,000 participants in 36 African countries showed that the majority viewed China's economic and political activities as a welcome contribution to development for both sides, and showed a positive attitude toward China's investments in infrastructure and business, as well as China-made products. The survey indicated that China enjoys growing popularity and influence on the continent. Nearly 66 percent of respondents have positive attitudes toward China's influence on their countries. In Niger, Liberia and Cameroon, more than 80 percent of the public holds generally favorable views of China. In Mali, the figure is as high as 91 percent. In addition, 56 percent of respondents believe that China's assistance and investments meet their needs for development "well" or "very well." The report showed that in the eyes of respondents, China's popularity is second only to the United States' a model of development. Recent years have witnessed an obvious positive trend in the exchanges of governance experience between China and African countries. For example, South Africa's ruling party, the African National Congress (ANC), boosted ties with the Communist Party of China (CPC) by sending its officials to study at the Party School of the CPC Central Committee. 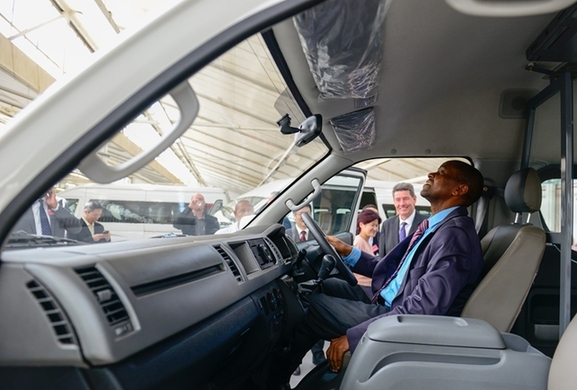 At the end of July 2016, more than 200 Africans, including 70 ministerial-level officials and 37 envoys and diplomats, visited the Suzhou Industrial Park in Jiangsu Province to learn from China's experiences in development. Africans have taken this experience to heart by establishing or upgrading a number of industrial parks in their own countries and setting up a group of regional vocational education centers and capacity-building colleges for training hundreds of thousands of professionals and technical personnel. The personnel training has helped realize the transfer of technologies to meet the needs of African countries for future sustainable development and industrialization. Cooperation between China and Africa still faces challenges that cannot be ignored. First of all, African countries have their own different national conditions. Differences in terms of national status, geographical locations, resource endowment and the industrial development foundation in the continent have impact on the pace and scale of bilateral industrial capacity cooperation. Chinese enterprises should be fully prepared by doing adequate field research and studies for making investments in Africa. However, excess capacity issues in China may vary by region. Different industries in China should cooperate with their African counterparts based on their own advantages so as to achieve better results in industrial alignment. The African continent as a whole is stable, but some regions are still under the threat of terrorism and political instability. Some terrorist organizations such as North Africa's Al Qaeda in the Islamic Maghreb, Somalia's Al Shabab, Nigeria' Boko Haram and ISIS pose a threat to Africa's peace and security. Apart from terrorist activities, some are facing internal unrest, and even civil war, such as the Mali crisis, South Sudan's civil war and Libya's Tribes Army issue. Even stable Ethiopia had to implement a six-month state of emergency starting October 2016 due to large-scale demonstrations and riots. A global long-term economic downturn and rising trade protectionism have hampered the recovery of the African economy. Since 2016, Africa's key oil producing countries such as Nigeria and Angola, and mining exporters such as South Africa and Zambia, have been facing economic downturn risks due to the low prices of oil and commodities. There is a great need for global trade liberalization no matter whether it is implementing the Belt and Road Initiative or pushing forward China-Africa capacity cooperation.